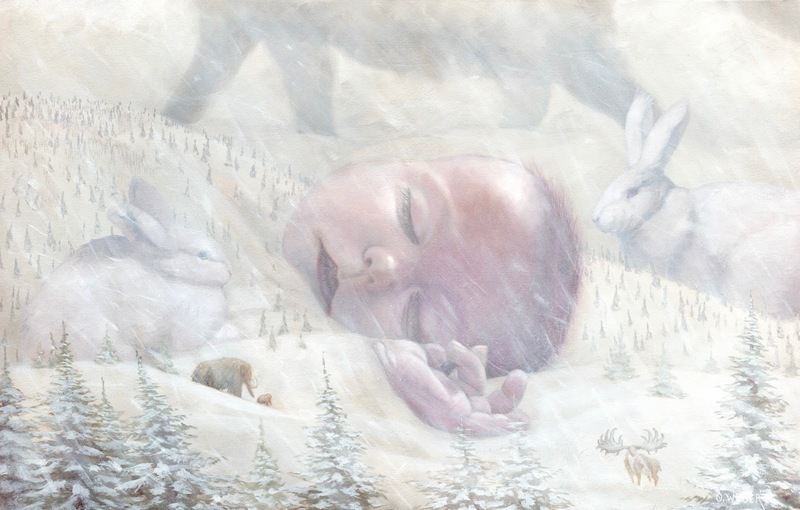 A Winter's Dream, 17" x 11", Oil on Paper on Masonite, 2015. Back in August, the 6th to be exact, Sarah and I welcomed our baby girl, Dagmar, into the world. She is now turning 6 months old and I am just now getting around to posting the first blog post since the summer. She's a lot of work, but not enough to excuse my laziness about this blog. Anyways, for the past three years I have done a Nisse painting as my Winter card, but for some reason I just wasn't in the mood to come up with a new Nisse painting, and I just didn't feel like I had a great composition in mind this winter. So I looked to my new muse. I took a picture one morning of her sleeping, and worked in some creatures, new and old, real and surreal into the winter landscape around her. I've always wondered what she dreams, I can't imagine her dreams look like this, but I thought it was a cool idea. Also, I have been doing a One Sketch A Day sketchbook since New Year's, so please follow me on Instagram to keep up with my sketches! Lately, I've been doing a lot of animals with horns and antlers.